Santa is watching! You look very festive, Lily and Edward! I know that you two are ALWAYS good!!! You two look like you're ready to party! You guys look nice and warm! Well, don't you two look very festive!!! At least you didn't have to wear antlers and hats like we did. Dear Lily and Edward, You both look so very festive and ready for Christmas. Hope you have a great weekend! Santa will bring you two lots of good stuff! You two look totally ready for Santa! Being good? Well of course you are - you ALWAYS are.....right????? HMMM???? You two are looking great in your holiday gear. 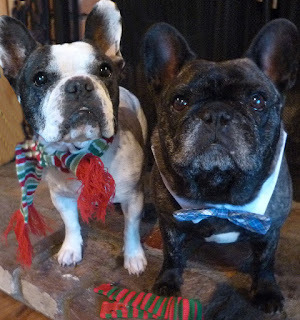 We think you are both looking very snazzy in your Christmas cheer!! Yup, gotta get on the right side of the list! You two look spectacular in all your red and green stuff! Happy Howlidays! Popping in to wish you guys the bestest & merriest of Christmas ever!! Hope Santa Paws brings you all kinds of great stuffs!!! That's right, you want to get lots of goodies from Santa!